I thought that a good way of tidying up the blog year would be to post about three things that have transformed life in the workshop this year. It’s hard to believe that we’re actually at the point of wrapping up the year but here we are. I am very much looking forward to some precious time with the family and forgetting about the workshop for a while. As I spend time in the workshop making pots, I am constantly refining, refining, refining. How do I make that process better, smoother, more efficient? How do I improve that skill or technique? It usually comes out of the realisation that a particular standard isn’t good enough anymore. To improve that standard, it often boils down to a tool not being good enough. 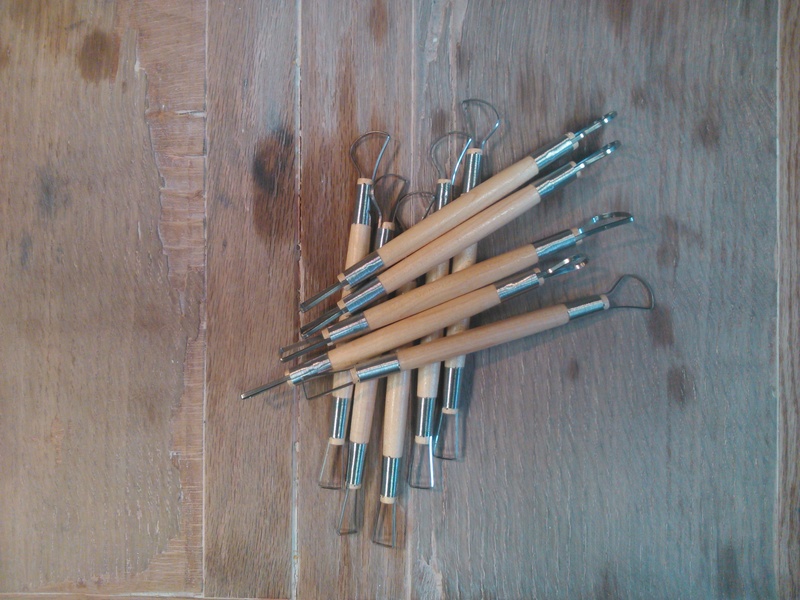 There have been three things, relating to tools, that have changed my life in the workshop. 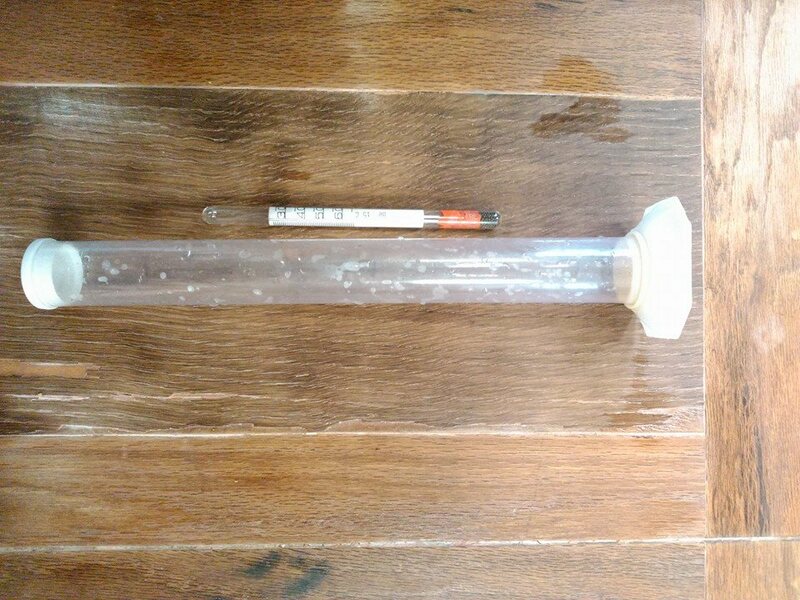 The first has been the purchase of a hydrometer. This is an amazing, transformative tool. 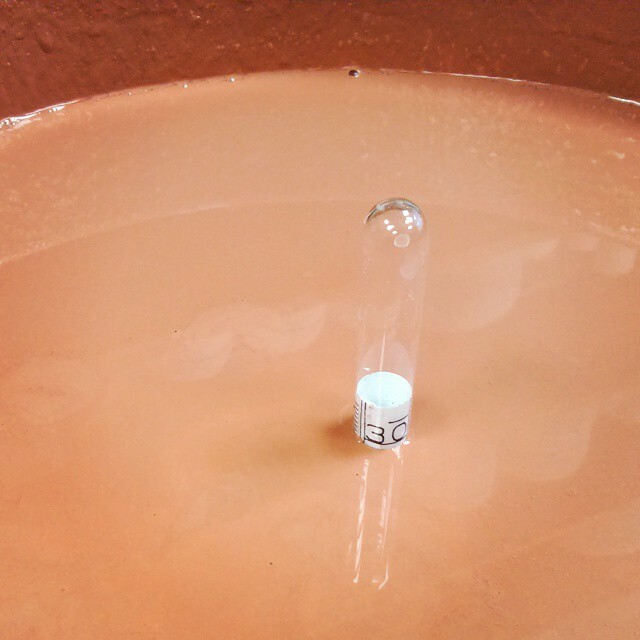 It measures the specific gravity of your glaze and tells you the proportion of glaze material to water. It is the simplicity of it that is so surprising. It sits in the glaze bucket and you measure the reading. The glaze in the picture reads 31. Every time I do any glazing the hydrometer needs to read 31. If it reads 34, I need to add more water – 28, I need to wait for the glaze to settle out, then take some water away. Having a hydrometer has encouraged me to more vigilant about the consistency of the glaze, and consequently, more considered of the end result, the glazed pot. I have found that I am constantly needing to check and adjust the consistency of the glaze outside of mixing a new batch and the hydrometer helps me do that quickly and efficiently. A revelation! I had been scared of getting one, now I can’t do without it. The second point of change has been understanding the benefits of using sharp tools, particularly in relation to turning. Blunt turning tools are extremely inefficient – they make for slow and imprecise turning. When the tools are blunt, you have to press harder and they don’t cut cleanly. Your best pots are never going to be made this way. My turning has improved immeasurably as a result of taking proper consideration of my tools. I only use one type of tool and replace it regularly. It does mean I get through the tools but once you’ve stopped using blunt tools, you’ll never want to go back again. A revelation! The third change is maybe the more helpful of the three – and that is writing down the height and width measurements of the wet pot on the wheelhead. Previously, I was quite lackadaisical about not only writing down the measurements but sticking to them. I have always written down the clay weight for each pot but I have not been strict with myself regarding the measurements. I have a natural inclination to keep pulling a wall far beyond the requirements of the pot. The trouble with this is that if I want a wall height to be 8cm, I often end up pulling it to 9/9.5cm. The part that suffers most with this is the lip, whether it be of the bowl, mug or beaker. Also, consistency suffers. Because often I only have the measurement across and not the height, the height can alter markedly at different throwing sessions. This can be extremely frustrating. 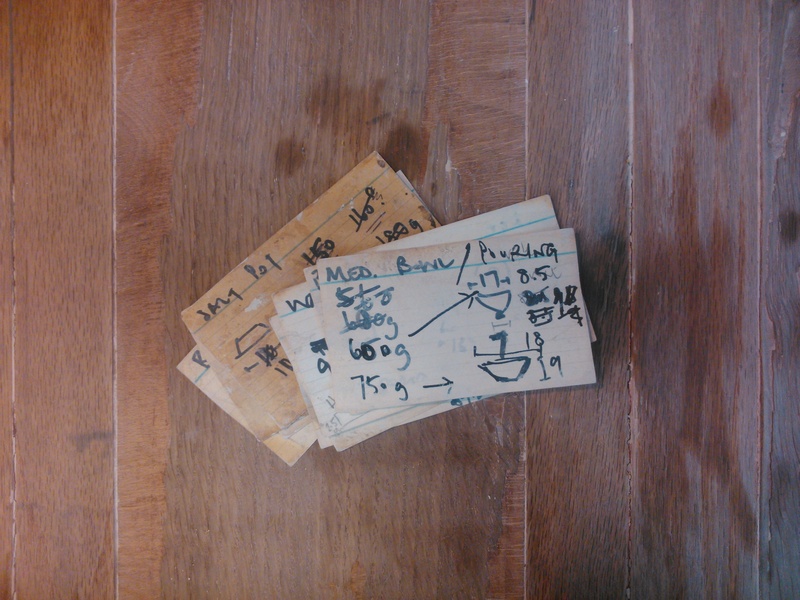 I was reading James and Tilla Waters’ blog one day and read in a post that James (who does most of the throwing) is meticulous about writing down the wet measurements of the pots. So, I have become meticulous also. This leads me to my third and a half point – a reminder for me, really. Thinness isn’t everything. It is not a matter of simply throwing as thin as you can, without regard for the shape and proportion of the pot. Weight, balance and form are what matter. It has been a good year for Dove Street Pottery – I hope it has been for you, too. I wish you a very merry Christmas and New Year, and hope that they are everything you want them to be. You are currently viewing the archives for December, 2014 at The Hopeful Potter.